Ready to own the last jack you’ll ever need for your garage? Thanks to exceptional design, AC Hydraulic floor jacks are the perfect addition to any garage. They not only provide super low-clearance, but most models even come with a quick-lift pedal giving you even more convince while working in your garage or out at the track. These jacks provide an ultra-low clearance, combined with unbelievable height. 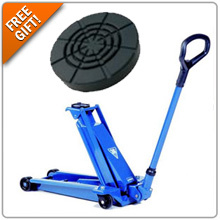 Plus, with high quality Danish manufacturing you have will have the ultimate floor jack for your garage. And now through September 1st you can receive a FREE rubber cushion ($24.00 savings) with any AC hydraulic jack purchase!